Sierra Stinson and Klara Glosova have invited artists to explore a gap. Gap is a void, gap is also a space between things. One may feel a need to patch it up, fill in the blank or embrace the void. 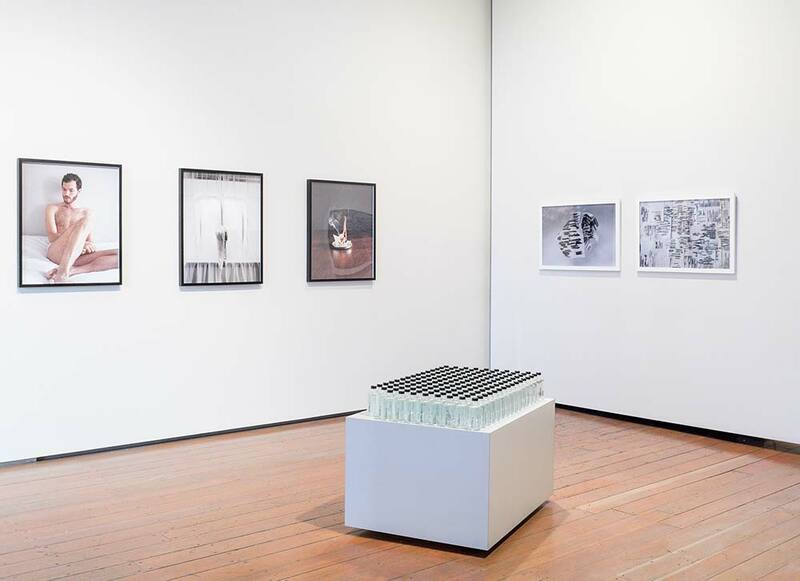 We have asked artists Alice Gosti, Britta Johnson, Doug Newman, Zack Bent, Neal Fryett, MKNZ, Rafael Soldi, Megumi Shauna Arai, Reilly Sinanan, Nat Evans and John Teske to create or re-visit works that speak of their relationship to the nonexistence or lack of. Because an absence without presence is like distance without space. Perhaps before the Big Bang there existed such a thing. Today, the world is full. Every moment is full, and within it's fullness we are each missing something. Absence is often associated with what is invisible to us. Works included in this exhibition look at other meanings of absence such as the distant, the virtual, the silent, the unspoken, the obscured and the hidden. It is our relationship between everything and nothing. For years I have ritualized the blacking out of my calendar and records of my life. What first started out as an act of anxiety eventually transformed into an intention to create detailed markings out of an erased past. I began to find beauty in the pen strokes and focus less on my shame. Some things I left untouched. These crossed out pages have become a map of what was, what is and what could be. Since I was an early child I was involved and trained in the midwestern rite of morel mushroom hunting, a fleeting and mysterious foraging practice that my family would pursue in the warm months of early spring. Two years ago under the guide of my friend Chan Pongkhamsing, I was initiated into the methods of morel hunting on newly ravaged forest fire land. Traversing burnt land is a mysterious and silent experience. While all parties are busy cutting and collecting mushrooms, the hush of the forest and the creaking of the trees are your only companions. It is both eerie and comforting. The forest new in its death, holds a reverse sublime that leaves it's black charcoal marks on you at every turn and permeates your nose with it's carbonized fragrance. These two works are my first attempts to externalize this experience visually. I am only on the cusp of letting the forest echo back through me, however in lieu of this exhibition's title Absence I found that the time was right. My son Ezra worked with me to make this video. When conversing with him about the exhibition theme he said when he thought about the word absence, silence was the first thing that came to mind. In Xan Aranda's documentary film Fever Year, musician Andrew Bird speculates that the lowgrade fever he's been experiencing continuously during a particularly strenuous touring schedule is not an indicator of illness, but an adaptation his body has developed to deal with his environment a new kind of stability. In general, from day to day, I'm not sure how I'm feeling, in my body. I'm not sure if the vague maladies I experience are the means by which my body is healing itself or deteriorating, whether my efforts to repair it are productive or destructive, whether an event is a cause or an effect. No healing process is completely linear, going unwaveringly from hurt to well, but some are more decisive; when trends are subtle or cyclical, it's easy to think that my body's workarounds are becoming its norm. This Homeostasis trio is part of a series of looping video pieces I've been working on depicting a psychoanatomy, my imagined insides. During this process, several works have been on my mind: Susan Robb's sculptures of her father's internal nasal polyps based solely on his descriptions, and for this trio especially, Anish Kapoor's Marsyas, three massive rings held in suspension by stretched red vinyl to make a buildingscale sculpture of bodily tunnels. Additional inspiration comes from my mother's physical therapy practice; both scientific and mysterious, it is aesthetically free of newagey stagecraft and full of exciting revelations of viscera in constant wiggly motion, membranes opening and closing, and energy swooshing around. Special thanks to Steve Fisk for mixing the audio. sustain what remains is a text instruction for creating a new work in the progressive absence of sound from a preexisting work. Evans and Teske each realized this text instruction they created. Teske used a new work for chamber orchestra that he composed in 2014, min, as his source material. Evans used a piece by 17th century baroque composer Marin Marais called La Badinage from his Suite D'Un Goût Étranger. In each example, we hear the transformation of an old work becoming new through this process the artists designed to filter sound through. Tearing, poking, detaching, gluing: out from a hot cluttered furnace chugs a freight train loaded with chemical sandwich peels and blended layer cakes. Unmixed colors swipe and swab their way across an inverted crystalline topography. Three dimensions and two, distilled and extrapolated under and over, back and forth. In these disconnected paintings, handwork is transfused, converted, projected, reclaimed by softly lit fantasy grids. 158 bottles of Holy Water. When my parents cleared out my grandmother's apartment in Italy after her death, they set aside all of her religious paraphernalia and gave it to me. She had lots of plastic bottles in the shape of Mary that were filled with Holy water. Which they say is water coming from the Holy land or water that has been blessed. As the water is the representation of the absence of the spirit, in this case the water is also the absence of my grandmother, and simultaneously the representation of the holy land. In my case Home. They say that 55% of an adult woman's body is water. Here are 158 bottles, 1209 oz of her water. I always take pictures in the present moment, informal portraits of the people that are a part of my life and the things I am inspired to remember. As I look over my work from the last 10,11,12 years I can see all the moments in the present creating this sacred document of the past. I didn't really know that Capitol Hill was gonna get torn apart, that the Cha Cha would move across town, or that The Jade Pagoda would become The Bait Shop, that my boyfriend would grow up in my photo's, that I would grow older, that my friends would grow up, that bands would start, break up, and new bands would start, and that couples would do the same. That my friend Vanessa would lose most of her belongings to a house fire and I would hold her memories in my photographs for her because her tangible ones are now gone. I didn't know know that all these 10,000 clicks in the present moment were creating this portrait of a community for the future that is now becoming about the past. I didn't know that I would come from Cochranton, Pennsylvania to Seattle to make this, but I did and it is exactly what I didn't know that I wanted to do. Sentimentality is a series of letters created for 23 individuals. Each letter is enclosed in an envelope marked with the name of its recipient. Each recipient is a person who has, in some capacity, affected the life of the artist. Their relationships range in quality from friends to lovers, exlovers, family members, mentors, and collaborators. A letter is only made public when its addressee chooses to remove the envelope. Over the course of the exhibit, the series elaborates upon each relationship as the letters are exposed. If your name is written at the top of a letter and you wish to open it, please check in with the gallery attendant. To open your letter, untie the bow and slide off the black envelope. When an envelope is removed it cannot go back on and will remain on display until February 14th, 2015. Each piece belongs to its recipient at the conclusion of the exhibition. These images are an emotional exorcism of sorts, they represent my struggle to reconstruct a life without the very thing that I thought defined it. Before my partner vanished suddenly, my relationship had become a catalyst for accessing a new way of making photographs, helping me define my own identity as a man. The breakup brought dramatic change to my work and I tapped into feelings that I never knew existed within me: panic, regret, fear and loss. This work chronicles the loss of the man I loved, and the importance of that relationship in defining my identity.